If you or a family member has cerebral palsy, or if you are an education or speech professional that works with individuals with cerebral palsy, then you know how challenging communication can be. While symptoms vary from person to person, speech disorders can result from the motor deficits associated with cerebral palsy. Language disorders can also be associated with cerebral palsy. These speech and language challenges impact both individuals with cerebral palsy and their communication partners. The good news? 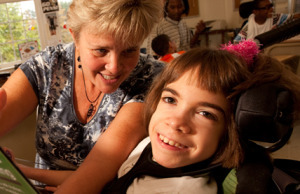 With support, individuals with cerebral palsy can express themselves to their fullest potential. Improved communication can lead to a full and satisfying life. Difficulty co-coordinating muscle movements needed for speech. Social problems, related to difficulty communicating. 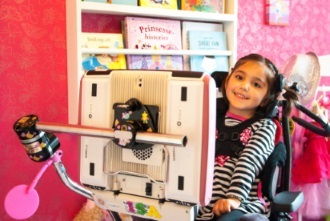 Tobii Dynavox provides a range of tools that individuals with cerebral palsy need to overcome communication challenges, develop language and literacy skills, make choices, speak their minds and fully participate in life! A six year old who already reads and writes Norwegian and Spanish and is currently learning English. She speaks her mind like any child her age and despite suffering from Cerebral Palsy is living an independent life full of opportunities.